HARTFORD – State Representatives Doug Dubitsky (R-47) and Kathleen McCarty (R-38) were joined by fellow Democrat Senator Cathy Osten (D-19) and House member Kevin Ryan (D-139) late last month to say goodbye to the Eastern Regional Mental Health Board (ERMHB) as their contract with the Department of Mental Health and Addiction Services (DMHAS) came to an end. Despite the official partnership between ERMHB and DMHAS concluding on February 23rd, 2018, the board met with the attending lawmakers at the Southeastern Mental Health Authority’s facility in Norwich for one final time on Thursday, August 9th to celebrate their many accomplishments over the last 43 years together. The Regional Behavioral Health Action Organizations in region III will now absorb ERMHB and all of its functions. 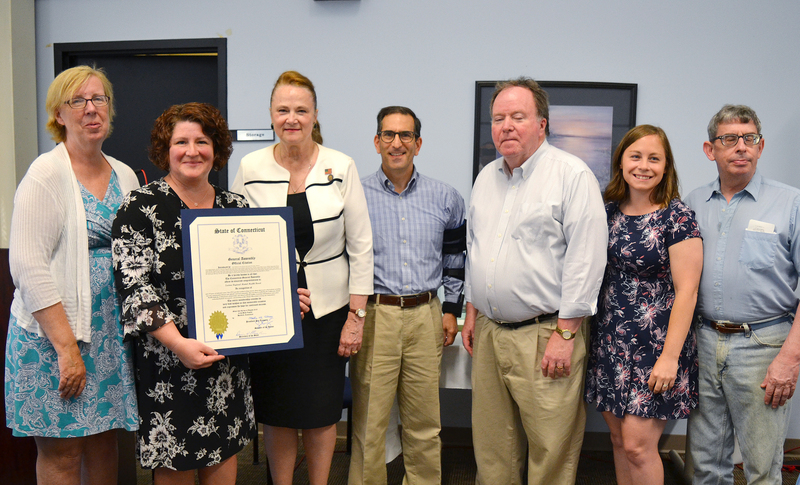 (L-R) Senator Cathy Osten, Deborah Walker, Acting Director of the ERMHB , State Representative Kathleen McCarty, State Representative Doug Dubitsky, State Representative Kevin Ryan, Kati Mapa, Former Executive Director, and ERMHB President, Howard Beatman.